For the Talmudical tractate, see Shevu'ot. One of the Three Pilgrimage Festivals. Celebrates the revelation of the Five Books of the Torah by God to Moses and to the Israelites at Mount Sinai, 49 days (7 weeks) after the Exodus from Egypt. Commemorates the wheat harvesting in the Land of Israel. Culmination of the 49 days of the Counting of the Omer. Festive meals. All-night Torah study. Recital of Akdamut liturgical poem in Ashkenazic synagogues. Reading of the Book of Ruth. Eating of dairy products. Decoration of homes and synagogues with greenery (Orach Chayim, 494). Shavuot has a double significance. It marks the all-important wheat harvest in Israel (Exodus 34:22), and it commemorates the anniversary of the day when God gave the Torah to the nation of Israel assembled at Mount Sinai—although the association is not explicit in the Biblical text between the giving of the Torah (Matan Torah) and Shavuot. The holiday is one of the Shalosh Regalim, the three Biblical pilgrimage festivals. The word Shavuot means weeks, and it marks the conclusion of the Counting of the Omer. Its date is directly linked to that of Passover; the Torah mandates the seven-week Counting of the Omer, beginning on the second day of Passover, to be immediately followed by Shavuot. This counting of days and weeks is understood to express anticipation and desire for the giving of the Torah. On Passover, the people of Israel were freed from their enslavement to Pharaoh; on Shavuot, they were given the Torah and became a nation committed to serving God. The yahrzeit of King David is traditionally observed on Shavuot. Hasidic Jews also observe the yahrzeit of the Baal Shem Tov. Shavuot is one of the less familiar Jewish holidays to secular Jews in the Jewish diaspora, while those in Israel and the Orthodox community are more aware of it. According to Jewish law, Shavuot is celebrated in Israel for one day and in the Diaspora for two days. Reform Judaism celebrates only one day, even in the Diaspora. Shavuot is not explicitly named as the day on which the Torah was revealed by God to the Israelite nation at Mount Sinai in the Bible, although this is commonly quoted to be its main significance. What is textually connected in the Bible to the Feast of Shavuot is the season of the grain harvest, specifically of the wheat, in the Land of Israel. In ancient times, the grain harvest lasted seven weeks and was a season of gladness (Jer. 5:24, Deut. 16:9–11, Isa. 9:2). It began with the harvesting of the barley during Passover and ended with the harvesting of the wheat at Shavuot. Shavuot was thus the concluding festival of the grain harvest, just as the eighth day of Sukkot (Tabernacles) was the concluding festival of the fruit harvest. During the existence of the Temple in Jerusalem, an offering of two loaves of bread from the wheat harvest was made on Shavuot. In the Bible, Shavuot is called the Festival of Weeks (Hebrew: חג השבועות, Ḥag ha-Shavuot, Exodus 34:22, Deuteronomy 16:10); Festival of Reaping (Hebrew: חג הקציר, Ḥag ha-Katsir, Exodus 23:16), and Day of the First Fruits (Hebrew יום הבכורים, Yom ha-Bikkurim, Numbers 28:26). Shavuot, the plural of a word meaning "week" or "seven," alludes to the fact that this festival happens exactly seven weeks (i.e. "a week of weeks") after Passover. The Talmud refers to Shavuot as Atzeret (Hebrew: עצרת‎, literally, "refraining" or "holding back"), referring to the prohibition against work on this holiday and to the conclusion of the holiday and season of Passover. Since Shavuot occurs 50 days after Passover, Hellenistic Jews gave it the name "Pentecost" (πεντηκοστή, "fiftieth day"). Shavuot was also the first day on which individuals could bring the Bikkurim (first fruits) to the Temple in Jerusalem (Mishnah Bikkurim 1:3). The Bikkurim were brought from the Seven Species for which the Land of Israel is praised: wheat, barley, grapes, figs, pomegranates, olives, and dates (Deuteronomy 8:8). In the largely agrarian society of ancient Israel, Jewish farmers would tie a reed around the first ripening fruits from each of these species in their fields. At the time of harvest, the fruits identified by the reed would be cut and placed in baskets woven of gold and silver. The baskets would then be loaded on oxen whose horns were gilded and laced with garlands of flowers, and who were led in a grand procession to Jerusalem. As the farmer and his entourage passed through cities and towns, they would be accompanied by music and parades. At the Temple in Jerusalem, each farmer would present his Bikkurim to a Kohen in a ceremony that followed the text of Deut. 26:1–10. This text begins by stating: "An Aramean tried to destroy my father," referring to Laban's efforts to weaken Jacob and rob him of his progeny (Rashi on Deut. 26:5)—or by an alternate translation, the text states "My father was a wandering Aramean," referring to the fact that Jacob was a penniless wanderer in the land of Aram for 20 years (Abraham ibn Ezra on Deut. 26:5). The text proceeds to retell the history of the Jewish people as they went into exile in Ancient Egypt and were enslaved and oppressed; following which God redeemed them and brought them to the land of Israel. The ceremony of Bikkurim conveys gratitude to God both for the first fruits of the field and for His guidance throughout Jewish history (Scherman, p. 1068). Shavuot is unlike other Jewish holidays in that it has no prescribed mitzvot (Torah commandments) other than traditional festival observances of meals and merriment; and the traditional holiday observances of special prayer services and the required abstention from work. However, it is also characterized by many minhagim (customs). תורה – Torah, engaging in all-night Torah study. The Akdamut (Aramaic: אקדמות‎) is a liturgical poem extolling the greatness of God, the Torah, and Israel that is read publicly in the synagogue right before the morning reading of the Torah on the first day of Shavuot. It was composed by Rabbi Meir of Worms, whose son was murdered during the First Crusade in 1096. Rabbi Meir was forced to defend the Torah and his Jewish faith in a debate with local priests, and successfully conveyed his certainty of God's power, His love for the Jewish people, and the excellence of Torah. Afterwards he wrote Akdamut, a 90-line poem in the Aramaic language that stresses these themes. The poem is written in a double acrostic pattern according to the order of the Hebrew alphabet. In addition, each line ends with the syllable ta (תא), the last and first letters of the Hebrew alphabet, alluding to the endlessness of Torah. The traditional melody that accompanies this poem also conveys a sense of grandeur and triumph. Sephardi Jews do not read Akdamut, but before the evening service they sing a poem called Azharot, which sets out the 613 commandments. The positive commandments are recited on the first day and the negative commandments on the second day. The liturgical poem Yatziv Pitgam (Aramaic: יציב פתגם‎) is recited by some synagogues in the Diaspora on the second day of Shavuot. The author and his father's name appear in an acrostic at the beginning of the poem's 15 lines. Cheese blintzes, typically eaten by Ashkenazi Jews on Shavuot. Dairy foods such as cheesecake, cheese blintzes, and cheese kreplach among Ashkenazi Jews; cheese sambusak, kelsonnes (cheese ravioli), and atayef (a cheese-filled pancake) among Syrian Jews; kahee (a dough that is buttered and sugared) among Iraqi Jews; and a seven-layer cake called siete cielos (seven heavens) among Tunisian and Moroccan Jews are traditionally consumed on the Shavuot holiday. Yemenite Jews do not eat dairy foods on Shavuot. In keeping with the observance of other Jewish holidays, there is both a night meal and a day meal on Shavuot. Meat is usually served at night and dairy is served either for the day meal or for a morning kiddush. Before they received the Torah, the Israelites were not obligated to follow its laws, which include shechita (ritual slaughter of animals) and kashrut. Since all their meat pots and dishes now had to be made kosher before use, they opted to eat dairy foods. The Torah is compared to milk by King Solomon, who wrote: "Like honey and milk, it lies under your tongue" (Song of Songs 4:11). The gematria of the Hebrew word chalav (חלב, milk) is 40, corresponding to the 40 days and 40 nights that Moses spent on Mount Sinai before bringing down the Torah. According to the Zohar, each day of the year correlates to one of the Torah's 365 negative commandments. Shavuot corresponds to the commandment "Bring the first fruits of your land to the house of God your Lord; do not cook a kid in its mother's milk" (Exodus 34:26). Since the first day to bring Bikkurim (the first fruits) is Shavuot, the second half of the verse refers to the custom to eat two separate meals – one milk, one meat – on Shavuot. The Psalms call Mount Sinai Har Gavnunim (הר גבננים, mountain of majestic peaks, Psalm 68:16–17/15–16 ), which is etymologically similar to gevinah (גבינה, cheese). There are five books in Tanakh that are known as Megillot (Hebrew: מגילות, "scrolls") and are publicly read in the synagogues of some Jewish communities on different Jewish holidays. The Book of Ruth (מגילת רות, Megillat Ruth) is read on Shavuot because: (1) King David, Ruth's descendant, was born and died on Shavuot (Jerusalem Talmud Hagigah 2:3); (2) Shavuot is harvest time [Exodus 23:16], and the events of Book of Ruth occur at harvest time; (3) The gematria (numerical value) of Ruth is 606, the number of commandments given at Sinai in addition to the 7 Noahide Laws already given, for a total of 613; (4) Because Shavuot is traditionally cited as the day of the giving of the Torah, the entry of the entire Jewish people into the covenant of the Torah is a major theme of the day. Ruth's conversion to Judaism, and consequent entry into that covenant, is described in the book. This theme accordingly resonates with other themes of the day; (5) Another central theme of the book is hesed (loving-kindness), a major theme of the Torah. According to the Midrash, Mount Sinai suddenly blossomed with flowers in anticipation of the giving of the Torah on its summit. Greenery also figures in the story of the baby Moses being found among the bulrushes in a watertight cradle (Ex. 2:3) when he was three months old (Moses was born on 7 Adar and placed in the Nile River on 6 Sivan, the same day he later brought the Jewish nation to Mount Sinai to receive the Torah). 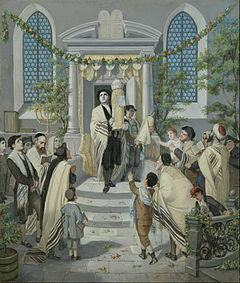 For these reasons, many Jewish families traditionally decorate their homes and synagogues with plants, flowers and leafy branches in honor of Shavuot.Some synagogues decorate the bimah with a canopy of flowers and plants so that it resembles a chuppah, as Shavuot is mystically referred to as the day the matchmaker (Moses) brought the bride (the nation of Israel) to the chuppah (Mount Sinai) to marry the bridegroom (God); the ketubah (marriage contract) was the Torah. Some Eastern Sephardi communities actually read out a ketubah between God and Israel, composed by Rabbi Israel Najara as part of the service. This custom was also adopted by some Hasidic communities, particularly from Hungary. The Vilna Gaon cancelled the tradition of decorating with trees because it too closely resembles the Christian decorations for their holidays. The practice of staying up all Shavuot night to study Torah – known as Tikkun Leil Shavuot (Hebrew: תקון ליל שבועות‎) – has its source in the Midrash, which relates that the night before the Torah was given, the Israelites retired early to be well-rested for the momentous day ahead. They overslept and Moses had to wake them up because God was already waiting on the mountaintop. To rectify this perceived flaw in the national character, many religious Jews stay up all night to learn Torah. The custom of all-night Torah study goes back to 1533 when Rabbi Joseph Caro, author of the Shulchan Aruch, then living in Ottoman Salonika, invited Rabbi Shlomo Halevi Alkabetz and other Kabbalistic colleagues to hold Shavuot-night study vigils for which they prepared for three days in advance, just as the Israelites had prepared for three days before the giving of the Torah. During one of those study sessions, an angel appeared and taught them Jewish law. The mass-consumption of coffee in the Ottoman empire is thought to be one factor in the emergence of the practice of all-night Torah study on Shavuot. Any subject may be studied on Shavuot night, although Talmud, Mishnah, and Torah typically top the list. People may learn alone or with a chavruta (study partner), or attend late-night shiurim (lectures) and study groups. In Jerusalem, tens of thousands of people finish off the nighttime study session by walking to the Western Wall before dawn and joining the sunrise minyan there. This practice began in 1967. One week before Shavuot of that year, the Israeli army recaptured the Old City in the Six-Day War, and on Shavuot day, the army opened the Western Wall to visitors. Over 200,000 Jews came to see and pray at the site that had been off-limits to them since 1948. The custom of walking to the Western Wall on Shavuot has continued every year since. In keeping with the custom of engaging in all-night Torah study, the Arizal, a leading Kabbalist of the 16th century, arranged a special service for the evening of Shavuot. The Tikkun Leil Shavuot ("Rectification for Shavuot Night") consists of excerpts from the beginning and end of each of the 24 books of Tanakh (including the reading in full of several key sections such as the account of the days of creation, The Exodus, the giving of the Ten Commandments and the Shema) and the 63 books of Mishnah, followed by the reading of Sefer Yetzirah, the 613 commandments as enumerated by Maimonides, and excerpts from the Zohar, with opening and concluding prayers. The whole reading is divided into thirteen parts, after each of which a Kaddish di-Rabbanan is recited when the Tikkun is studied with a minyan. This service is held in most communities, with the notable exception of Spanish and Portuguese Jews. The service is printed in a special book, itself also called Tikkun Leil Shavuot. There exist similar books for the vigils before the seventh day of Pesach and Hosha'ana Rabbah. In the 19th century, several Orthodox synagogues in Britain and Australia held confirmation ceremonies for 12-year-old girls on Shavuot, a precursor to the modern Bat Mitzvah. The early Reform movement made Shavuot into a religious school graduation day. Today, Reform synagogues in North America typically hold confirmation ceremonies on Shavuot for students aged 16 to 18 who are completing their religious studies. The graduating class stands in front of an open ark, recalling the standing of the Israelites at Mount Sinai for the giving of the Torah. Since the Torah does not specify the actual day on which Shavuot falls, differing interpretations of this date have arisen both in traditional and non-traditional Jewish circles. These discussions center around two ways of looking at Shavuot: the day it actually occurs (i.e., the day the Torah was given on Mount Sinai), and the day it occurs in relation to the Counting of the Omer (being the 50th day from the first day of the Counting). While most of the Talmudic Sages concur that the Torah was given on the sixth of Sivan in the Hebrew Calendar; R. Jose holds that it was given on the seventh of that month. According to the classical timeline, the Israelites arrived at the wilderness of Sinai on the new moon (Ex. 19:1) and the Ten Commandments were given on the following Shabbat (i.e., Saturday). The question of whether the new moon fell on Sunday or Monday is undecided (Talmud, tractate Shabbat 86b). In practice, Shavuot is observed on the sixth day of Sivan in Israel and a second day is added in the Jewish diaspora (in keeping with a separate rabbinical ruling that applies to all biblical holidays, called Yom tov sheni shel galuyot, Second-Day Yom Tov in the Diaspora). The Torah states that the Omer offering (i.e., the first day of counting the Omer) is the first day of the barley harvest (Deut. 16:9). It should begin "on the morrow after the Shabbat", and continue to be counted for seven Sabbaths. (Lev. 23:11). The Talmudic Sages determined that "Shabbat" here means a day of rest and refers to the first day of Passover. Thus, the counting of the Omer begins on the second day of Passover and continues for the next 49 days, or seven complete weeks, ending on the day before Shavuot. According to this calculation, Shavuot will fall on the day of the week after that of the first day of Passover (e.g., if Passover starts on a Thursday, Shavuot will begin on a Friday). Karaites differ in their understanding of "morrow after the Sabbath". Karaites interpret the Sabbath to be the first weekly Sabbath that falls during Passover. This is supported by Leviticus 23:16 which speaks of the day after the seventh sabbath being the 50th day. This seventh Sabbath can only be a weekly Sabbath, and thus the day after is automatically a Sunday. As a result, the Karaite Shavuot is always on a Sunday, although the actual Hebrew date varies (which compliments the fact that a specific date is never given for Shavuot in the Torah, the only holiday for which this is the case). Other non-Rabbinical religious leaders such as Anan ben David (founder of the Ananites); Benjamin al-Nahawandi (founder of the Benjaminites); Ismail al-Ukbari (founder of a 9th-century messianic Jewish movement in Babylon); Musa of Tiflis (founder of a 9th-century Jewish movement in Babylon); and Malik al Ramli (founder of a 9th-century Jewish movement in the Land of Israel) additionally recognized that Shavuot should fall out on a Sunday. Most secular scholarship, as well as Catholics and the historical Sadducees and Boethusians, dispute the Rabbinic interpretation. They infer the "Shabbat" referenced is the weekly Shabbat. Accordingly, the counting of the Omer always begins on the Sunday of Passover, and continues for 49 days, so that Shavuot would always fall on a Sunday as well. This literal interpretation of 'Shabbat' as the weekly Shabbat, was shared by the 2nd-century BCE author of the Book of Jubilees who was motivated by the priestly sabbatical solar calendar of the 3rd and 2nd centuries BCE, which was designed to have festivals and Sabbaths fall on the same day of the week every year. On this calendar (best known from the Book of Luminaries in 1 Enoch), Shavuot fell on the 15th of Sivan, a Sunday. The date was reckoned fifty days from the first Sabbath after Passover (i.e. from the 25th of Nisan). Thus, Jub. 1:1 claims that Moses ascended Mount Sinai to receive the Torah "on the sixteenth day of the third month in the first year of the Exodus of the children of Israel from Egypt". In Jub. 6:15–22 and 44:1–5, the holiday is traced to the appearance of the first rainbow on the 15th of Sivan, the day on which God made his covenant with Noah. The Qumran community, commonly associated with the Essenes, held in its library several texts mentioning Shavuot, most notably a Hebrew original of the Book of Jubilees, which sought to fix the celebration of this Feast of Weeks on 15 of Sivan, following their interpretation of Exodus 19:1. ^ The Christian observance of Pentecost is a different holiday, but was based on a New Testament event that happened around the gathering of Jesus's followers on this Jewish holiday (Acts 2:1 and following). ^ "Dates for Shavuot". Hebcal.com by Danny Sadinoff and Michael J. Radwin (CC-BY-3.0). Retrieved August 26, 2018. ^ "The Baal Shem Tov—A Brief Biography". Chabad. Retrieved June 12, 2016. ^ a b Goldberg, J.J. (May 12, 2010). "Shavuot: The Zeppo Marx of Jewish Holidays". The Forward. Retrieved May 24, 2011. ^ Wein, Rabbi Berel (May 21, 2010). "Shavuot Thoughts". The Jerusalem Post. ^ See, for example, "BBC – Religions – Judaism:Shavuot". BBC. Retrieved May 18, 2018. ^ Z'man matan toratenu ("the time of the giving of our Torah [Law]") is a frequent liturgical cognomen for Shavuot. See, for example, "The Standard Prayer Book:Kiddush for Festivals". sacred-texts.com. Retrieved May 18, 2018. ^ Wilson, Marvin (1989). Our Father Abraham: Jewish Roots of the Christian Faith. p. 43. ^ Goodman, Robert (1997). Teaching Jewish Holidays: History, Values, and Activities. p. 215. ^ a b Bogomilsky, Rabbi Moshe (2009). "Dvar Torah Questions and Answers on Shavuot". Sichos in English. Retrieved January 22, 2018. ^ Wein, Rabbi Berel (2005). "Shavuos". torah.org. Retrieved June 6, 2011. ^ The Temple Institute. "The Festival of Shavout: Bringing the Firstfruits to the Temple". The Temple Institute. Retrieved September 5, 2007. ^ "Customs of Shavuot". June 30, 2006. ^ ""Akdamut" and "Ketubah"". June 30, 2006. ^ "YUTorah Online - Yatziv Pitgam, One of Our Last Aramaic Piyyutim (Dr. Lawrence Schiffman)". ^ Wein, Rabbi Berel (May 10, 2005). "Cheese & Flowers". Aish.com. Retrieved May 24, 2011. ^ a b "Shavuot – Hag ha'Bikkurim or Festival of the First Fruits". In Mama's Kitchen. Archived from the original on May 6, 2007. Retrieved May 24, 2011. ^ Marks, Gil (2010). Encyclopedia of Jewish Food. John Wiley & Sons. p. 524. ISBN 978-0-470-39130-3. ^ Marks, Encyclopedia of Jewish Food, p. 87. ^ a b c d Kaplan, Sybil. "Shavuot Foods Span Myriad Cultures". Jewish News of Greater Phoenix. Archived from the original on June 10, 2011. Retrieved May 24, 2011. ^ Kagan, Aaron (May 29, 2008). "Beyond Blintzes: A Culinary Tour of Shavuot". The Forward. Retrieved May 24, 2011. ^ "Shavuot Tidbits: An Overview of the Holiday". Torah Tidbits. ou.org. 2006. Retrieved January 22, 2018. ^ a b Simmons, Rabbi Shraga (May 27, 2006). "Why Dairy on Shavuot?". Aish.com. Retrieved May 24, 2011. ^ Erdstein, Rabbi Baruch E.; Kumer, Nechama Dina (2011). "Why do we eat dairy foods on Shavuot?". AskMoses.com. Retrieved May 24, 2011. ^ The other four are the Book of Lamentations, read on Tisha B'Av; the Book of Ecclesiastes, read on Sukkot; the Book of Esther (Megillat Esther) read on Purim; and the Song of Songs, the reading for Passover. See Five Megillot for further details. ^ Rosenberg, Yael. "Reading Ruth: Rhyme and Reason". Mazor Guide. Mazornet, Inc. Retrieved May 30, 2017. ^ a b Ross, Lesli Koppelman. "Shavuot Decorations". My Jewish Learning. Retrieved May 30, 2017. ^ Goodman, Philip. "The Shavuot Marriage Contract". My Jewish Learning. Retrieved May 30, 2017. ^ Shir Hashirim Rabbah 1:57. ^ Ullman, Rabbi Yirmiyahu (May 22, 2004). "Sleepless Shavuot in Shicago". Ohr Somayach. Retrieved September 5, 2007. ^ Altshuler, Dr. Mor (December 22, 2008). "Tikkun Leil Shavuot of R. Joseph Karo and the Epistle of Solomon ha-Levi Elkabetz". jewish-studies.info. Retrieved June 8, 2011. ^ Altshuler, Mor (May 22, 2007). "Let each help his neighbor". Haaretz. Retrieved September 5, 2007. ^ "Joseph Karo". Jewish Virtual Library. 2011. Retrieved June 8, 2011. ^ Sokolow, Moshe (May 24, 2012). "Sleepless on Shavuot". Jewish Ideas Daily. Retrieved July 22, 2013. ^ Horowitz, Elliot (1989). "Coffee, Coffeehouses, and the Nocturnal Rituals of Early Modern Jewry". AJS Review. 14 (1): 17–46. doi:10.1017/S0364009400002427. JSTOR 1486283. ^ a b c Fendel, Hillel (May 28, 2009). "Who Replaced My Cheese with Torah Study?". Arutz Sheva. Retrieved June 8, 2011. ^ a b Wein, Rabbi Berel (May 16, 2002). "Shavuot: Sleepless Nights". Torah Women.com. Archived from the original on September 23, 2011. Retrieved June 8, 2011. ^ a b "Shavuot". NSW Board of Jewish Education. 2011. Retrieved January 22, 2018. ^ Rosenblum, Jonathan (May 31, 2006). "Celebrating Shavuos Alone". Cross-Currents. Retrieved June 8, 2011. ^ Simmons, Rabbi Shraga (May 12, 2001). "ABC's of Shavuot". Aish.com. Retrieved June 8, 2011. ^ "Learning on Shavuot Night - Tikun Leil Shavuot - an Insomniac's Preparation for the Torah". ^ Ross, Lesli Koppelman. "Tikkun Leil Shavuot". My Jewish Learning. Retrieved May 18, 2018. ^ Raymond Apple. "Origins of Bat-Mitzvah". OzTorah. Retrieved May 24, 2011. ^ Katz, Lisa (2011). "What is Judaism's confirmation ceremony?". About.com. Retrieved May 24, 2011. ^ "Shavuot". Jewish FAQ. Retrieved May 31, 2017. ^ Goldin, Shmuel (2010). Unlocking the Torah Text: Vayikra. Gefen Publishing House Ltd. p. 207. ISBN 9789652294500. ^ Kohn, Daniel. "Why Some Holidays Last Longer Outside Israel". My Jewish Learning. Retrieved May 31, 2017. ^ a b Ankori, Zvi, Karaites in Byzantium, p. 276. ^ Kohler, Kaufmann; Magnus, J. L. (2002). "Pentecost". Jewish Encyclopedia. Retrieved May 29, 2009. ^ Joseph Fitzmyer Responses to 101 questions on the Dead Sea scrolls 1992 p. 87 – "Particularly important for the Qumran community was the celebration of this Feast of Weeks on III/15, because according to Ex. 19:1 Israel arrived in its exodus-wandering at Mt. Sinai in the third month after leaving Egypt. Later the renewal of the Covenant came to be celebrated on the Feast of Weeks (see Jubilees). Qumran community was deeply researched by Flavius Josephus." Brofsky, David. "Hilkhot Moadim: Understanding the Laws of the Festivals." Jerusalem: Koren Publishers, 2013. Kitov, Eliyahu (1978). The book of our heritage: the Jewish year and its days of significance. Volume 3: Iyar-Elul. Jerusalem: Feldheim Publishers. ISBN 978-0-87306-151-3. Scherman, Nosson, ed. (1993). The Chumash: the Torah: Haftaros and five Megillos with a commentary anthologized from the Rabbinic writings. ArtScroll / Mesorah Publications. ISBN 978-0-89906-014-9. Wikimedia Commons has media related to Shavuot.